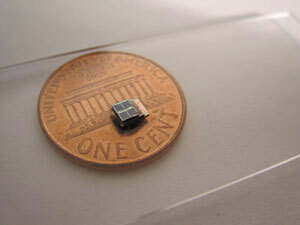 (Nanowerk News) A 9-cubic millimeter solar-powered sensor system developed at the University of Michigan is the smallest that can harvest energy from its surroundings to operate nearly perpetually. The designers are working with doctors on potential medical applications. The system could enable less-invasive ways to monitor pressure changes in the eyes, brain, and in tumors in patients with glaucoma, head trauma, or cancer. In the body, the sensor could conceivably harvest energy from movement or heat, rather than light, the engineers say. The inventors are working to commercialize the technology through a company led by Scott Hanson, a research fellow in the Department of Electrical Engineering and Computer Science.